The Mini E is a prototype all-electric vehicle based upon the popular Mini Cooper. In place of a gas engine, the Mini E uses a 204-hp electric motor to propel the vehicle. Electricity is stored in a rechargeable lithium-ion battery pack composed of 5,088 cells holding up to 35 kWh. The Mini E recharges in about 2.5 hours with a home charger installed at the customer's house. Regenerative braking helps to extend the range while driving. BMW estimates a range of about 150 miles per charge. BMW will build 500 Mini E cars and lease them to private and corporate customers in California, New York, and New Jersey. 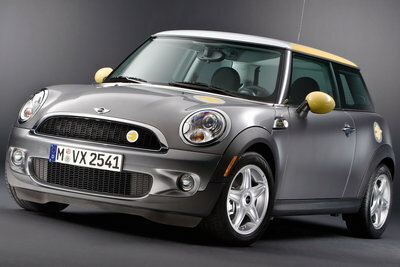 Customers will lease the car for 1 year and return the Mini E to BMW for evaluation. The lease includes the charger and maintenance of the propulsion system. The Mini E is a research electric vehicle based on the Mini Cooper. A 204-hp electric motor powers the Mini E. A large lithium-ion battery pack composed of some 5088 cells provides energy storage. The large battery pack replaces the rear seat making the Mini E a 2-seat vehicle. The Mini E features a unique paint scheme with a stylized electric plug representing the E. The gauges also show electric charge.